This Post has already been read 2499 times. Zong has always been at the forefront of offering iinovative offers that are not just profitable for the company but are also easy upon the customers pocket. 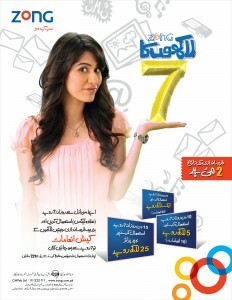 In continuation of the tradition, Zong has designed an attractive campaign to win different prizes based a miniml usage of Rs. 7 + tax per day. If a subscriber has continuous usage of Rs. 7 + tax or more for 5, 10, 15 days respectively will be eligible for different prizes. Lucky draw will be held on May, 2nd 2012. The more the consecutive usage by the customer, the more will be his/her chance of getting prizes.